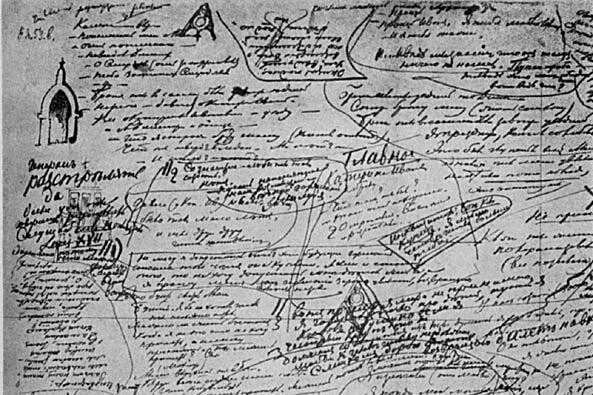 The strangeness of the Dostoevskian universe, so well conveyed by Virginia Woolf (‘We open the door and find ourselves in a room full of Russian generals, the tutors of Russian generals, their stepdaughters and cousins and crowds of miscellaneous people who are all talking at the tops of their voices about their most private affairs’), which foreigners tend to ascribe to some peculiarities of the Russian national character, is just as strongly felt and often resented by Russians themselves. Russian dictionaries list a common noun, derived from the writer’s name, dostoevshchina, which is a derogatory term describing an undesirable mode of behavior. A person guilty of dostoevshchina is being deliberately difficult, hysterical or perverse. Another possible meaning of the word is excessive and morbid preoccupation with one’s own psychological processes. The word is part of the normal Russian vocabulary, incidentally. Simon Karlinsky, ‘Dostoevsky as Rorschach Test’, New York Times, 13 June 1971. In Crime and Punishment (a Norton Critical Edition, Third Edition), edited by George Gibian, 615. New York: W.W. Norton & Company, Inc., 1989. Indeed. What’s even cooler is that it was written by the fella who wrote this post. <3 Rorschach. I like the way this "Angelico Nguyen" fellow thinks. Moving. Changing shape… but not mixing. No gray. I do want to say, for the record, that I did not write — and thus, can’t answer for — every comic strip featuring ‘Lolschach’. But I did write the script for the ‘crossing the street’ one, and will gladly answer for it. Also for the record: ‘Jayne Cobb’ Gravatar FTW. I see now that there are other Lolschach but my comment was turned towards that one. That’s a clever use of that quote of his in the previous comment. Also thanks! I’d set that as such 3 or so years ago when I first watched Firefly. Still wear the blue sun shirt! This reminds me of the fact that Dostoevsky was a contemporary of Herman Melville (Herman was two years older and lived ten years longer) and that like his Russian brother in philosophical treatises trussed out in fictional devices, some derivative of his literary fame has passed into common English paralance – but only through his idiot devil of a descendant, the criminally punishable Richard Melville Hall. A “Moby” is a leftwing (i.e. difficult, hysterical and/or perverse) comboxer who spreads false or outlandish information on a rightwing blog to bring disrepute to said blog. Make sure you contact UD about your defisnition – they haven’t found it yet, apparently. That’s cuz I’m a hipster Catholic. Urban Dictionary is too mainstream, man. Hey, where did JOB’s “Moby” comment go? One phrase summary of The Brothers Karamozov. And that’s just the chapter titles! Oh, dear. I’m afraid I’m one of those who just assumed all, or at least most, Russians were really like that. What is going on when one suspects life of being tragic, by virtue of the fact that every choice FOR something is inevitably a choice AGAINST something else? Is this purely a modern-day suspicion? Is this what Kierkegaard is talking about when he talks about the paralysis of having too many choices? Should the suspicion itself be identified as a temptation to despair, and be fought off by the appropriate means? More anon. I look forward to reading the thoughts of others. 1. What is going on is the Lost Self wandering the cosmos. This is a hard assessment to argue with, and (thus?) a hard act to follow. But I will add a few thoughts on this theme if I get a good chance in the next few days. Certainly there are one or two good poems on the topic. Both of these poems may be from the modern day, but I do believe the tragedy of choice, and the inevitability of dissatisfaction and regret for choices made, is a general human problem rather than a uniquely modern one. I’m hoping the Kommentariat’s resident economist, Bernardo, will make one of his too-rare appearances here, since the ‘tragic’ dilemma of choice looks to this layman like an opportunity cost, broadly defined. I think you’re both right about this not being solely a modern problem. And I think you’re right, Angelico, to put “tragic” in quotation marks. Could it be, maybe, that having to pass up some things for the sake of others seems tragic to us, but that this is often due to our own hubris? That is, we think sacrifice is tragic when really it is just a function of the spatio-temporal limitations that come with being human? I guess my inclination to define these questions as peculiarly relevant to our own culture comes from thinking about how this culture gives us so many competing opportunities for transcendence, in Percy’s sense. It is easier for us to escape than it has been (and continues to be) for a lot of people. I don’t remember having read the Dana Gioia poem before. Thanks for that. You bring food for thought, as usual; and as usual, I’ll need a little more time to chew on it. Re ‘the spatio-temporal limitations that come with being human’: I recently told a friend about my struggle to accept the fact (which fact had become clear as soon as the homework started piling up in third grade, but which I had refused squarely to acknowledge in the intervening two decades) that life presents so many obligations and desires, tasks and projects, that every single day is like a triage: All the things we (or, at least, I) should do or could do are like scores of gravely wounded patients bleeding out at the site of some awful accident. Some will have to die; something will have to give; and I will have to choose which to sacrifice. That is a pretty melodramatic way of stating the problem — and melodrama seems to me like ‘”tragedy” in quotation marks’. I’m not sure where hubris enters into it, though. Would that be in somehow believing ourselves/myself to have more power than we/I actually do? Somehow deluding ourselves/myself into believing that humans have the power to choose not only what, but whether, we must make sacrifices? And then blaming ourselves/myself (e.g., blaming some flaw of personal character or some poor choice) for failing to win what was actually a no-win scenario? More to follow, if the opportunity presents itself. Wow. Yes. Life is totally like triage. Or can seem like it. What I meant by hubris, I think, is this: we somehow trick ourselves into thinking we are the kind of creatures who, if we could just figure out how to transcend time and space sufficiently, would become capable of pursuing all (or at least most) of the “obligations and desires, tasks and projects,” presented to us. And it seems to me that the particularly modern element of this illusion comes from technological innovation, which seems to hold out the promise of allowing us to do more and more–and thus to sacrifice less and less. All streams run to the sea, but the sea is not full. If our ancestors had 10 or 100 streams, maybe we have thousands now. But the sea is still not full!